It's been a busy few weeks, with no real sign of it letting up just yet. One of the big jobs we've done is to drain the field next to the house. 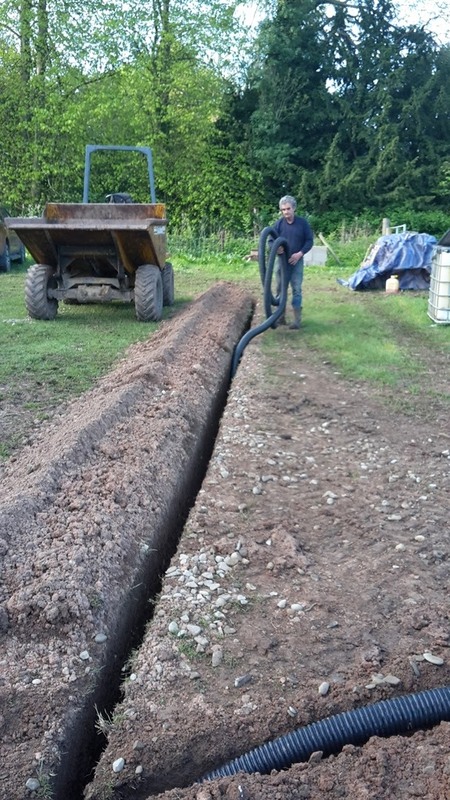 Although it's on a slope this field always lies wet and makes it a nightmare to move vehicles around, so whilst we were putting in new drains for the extension and had the machinery there we decided to go for it and put land drains in the whole field. 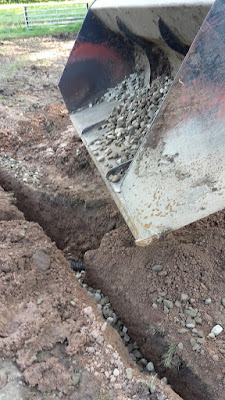 This involved using the Robocut with trencher to dig the trenches, lots of digging on the junctions by hand and cleaning out the bottom of the trenches with a home made tool (which I'm going to post about later). We then shovelled drainage gravel into the bottom of the trench, added perforated drainage pipe, jointed all the junctions and then added more drainage gravel on top before backfilling with soil. It was a massive job but one that should make the land much better for years to come. To me adding this kind of infrastructure is key to improving this place to make it somewhere that we're going to stay for a long long time. 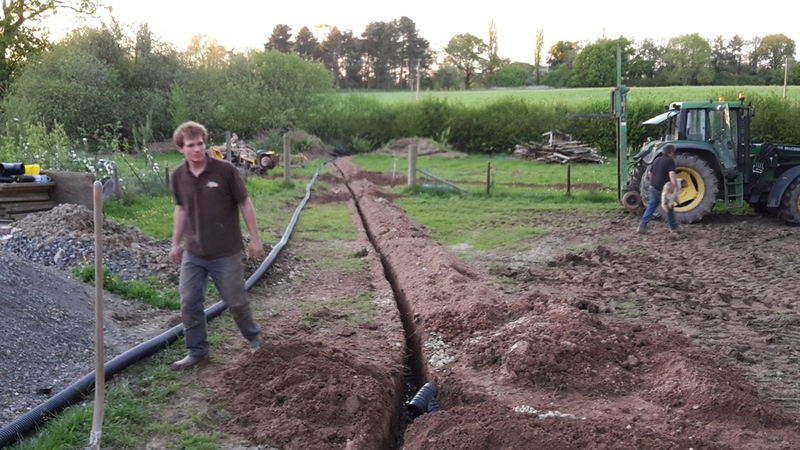 I'm just lucky with my family that between us we have the knowledge, skills and tools to the job for the lowest cost possible and it's always enjoyable working with them. 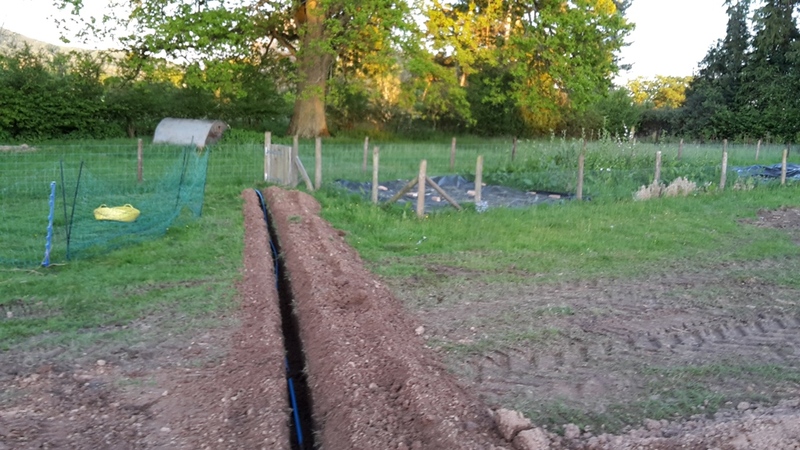 you're lucky, in Essex we are on HEAVY clay, a friend of mine has just laid hundreds of meters of land drain to find that the clay has sealed up all the holes, rendering the pipes absolutely useless! I have some similar drainage ditches upslope of my buildings. We get torrential rains here in the Smokey Mountains in summer when it thunderstorms. Without the ditches the water would rush down slope and right into the barn and shop. I recently replaced the soak-away pipes from my septic tank. If only he'd had a trench cutter like yours; my man used a huge JCB. The mess was terrible. Three cheers for family and friends who have the know-how and willingness to do such projects. We've done the same thing (on more than one piece of property), most recently (well, 20 years ago) when we moved onto our present property. We have the best neighbors in the world . . . and he just happens to be a heavy equipment/construction guy with all the machines necessary. Lucky we are! Your project looks so neat . . . like you guys really know what you're doing!